ANB is part of the heart and soul of Amarillo. Out there in the Panhandle, they’ve got a way of doing things that’s one part Texan, one part Midwest and all character. 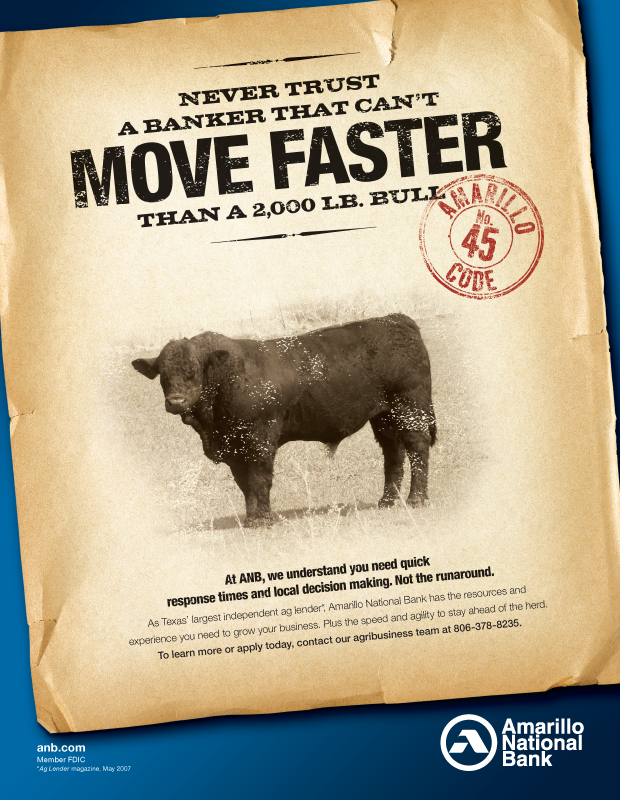 Call it the “Amarillo Code.” I helped develop and sustain this campaign at Kolar Advertising and Marketing. We created a program with hundreds of print ads and in-bank collateral materials, along with a complete overhaul of the bank’s website. Here, I’m featuring some of the fun headlines that helped capture the maverick spirit of this venerable bank. “Over the years, we’ve tapped Martha’s talents many times. Freelance, on-staff, on site, remote and everything in between. She’s off and running before many writers are out of the gate. Martha takes projects with the most mundane, most expected solutions and elevates them. Gives them personality. That’s what you hope you get from a writer.